Know how ADP redefined its traditional HR function to fit into the digital age by keeping human touch and personalized experience as the core of all the HR practices. Automatic Data Processing, Inc. famously known as ADP is a leading provider of human resources management software and services with a proud history that can be traced back to 1949. The company is a comprehensive global provider of cloud-based human capital management (HCM) solutions that unite HR, payroll, talent, time, tax and benefits administration, and a leader in business outsourcing services, analytics and compliance expertise. 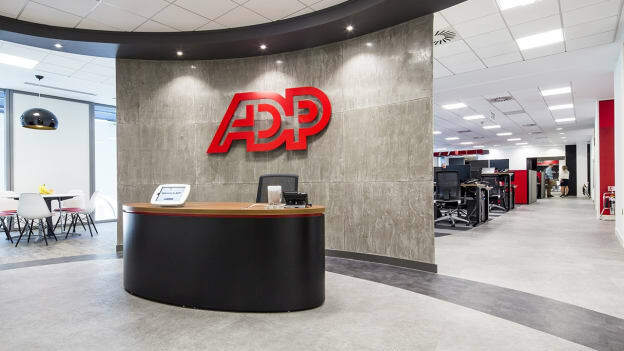 With a global workforce of more than 60,000 associates, ADP currently provides payroll, global HCM and outsourcing services in more than 140 countries and markets. ADP India – the global in-house center of ADP Inc. started in 1999. Till 2011, ADP India had 4,000 associates and 65 HR associates on board. Eight years down the line, the company now employs 10,000 associates with just 63 HR associates for the full lifecycle of HR functions. The case in point here is how the HR team remained flat to service twice the workforce size, and how this reduced the delivery time by half and built a consistent associate experience across the organization. For ADP, people have been central to the business — people inside ADP and people at the client’s location. ‘Human touch and creating a Personalized Experience’ formed the core of all the HR practices. However, in an attempt to keep the ‘human touch’ alive, the company was spending a lot of efforts in scaling up the organization. This meant either increase in headcount to manage the growth and ensure same service levels or look at a major overhaul to current processes where HR members do not spend the time on transactional low value-adding activities. In this article, we will describe how ADP, a pioneer in HCM solutions, redefined its traditional HR function to fit into the digital age. Over the past eight years the company’s HR team has adopted an approach whereby it tapped into the latest technologies and collaborated with its internal product and engineering teams to apply it in various HR contexts. 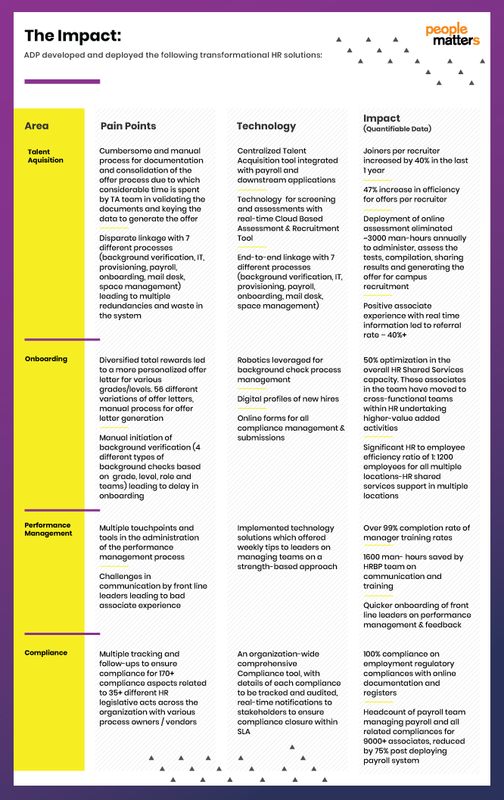 What digitization means to ADP? He further adds that, at ADP, the digital journey is all about providing that consistent experience available to associates inside ADP and outside ADP. For associates: Digital HR is all about providing a consistent experience - an experience which allows associates to manage their work and career in a transparent and efficient way. For business: Digital means implementing processes that enable efficiency and productivity. HR Team: Digital means doing more impactful role in terms of business growth, and associate experience. For ADP, digitizing HR was about achieving efficiency, experience and growth by implementing technology but with a human touch. The digital agenda for ADP was simple - Taking small steps on the road to a bigger transformation. The company started its digital journey by digitizing the in-house payroll process. “Earlier we had four members in the HR team managing the payroll for India associates but today, we have one associate who manages the entire payroll process,” adds Vipul. Once people started observing the value generated from challenging the status quo and digitizing the process, they asked for more. Hence, the smaller steps led to a mindset shift towards digitization which further led to the integration of each HR process on a single tool. 1. Documentation: The first step was creating a Standard Operating Procedure (SOP) for all the processes. All the teams in ADP had to create SOP for their respective teams since everything was getting translated from a paper-based system to a technology-based system. 2. Technology integration: Data comes from multiple sources and exists in many forms. To harness the true power of data, the team integrated all the data on a single platform. It allowed the organization to monitor, track and analyze data in real-time, from monitoring the effectiveness of technology implementation. 3. Setting up a change management & communication team: Digital transformation will fundamentally change your company's mission-critical processes and operations. Done right, it changes the way your company, works, thinks and addresses challenges. A team was setup to assess how a process is undergoing a change and what is the impact of digitizing a process. 4. Cross training: The spectrum of tasks that digital systems can do is evolving, which is likely to gradually increase the scope of what is considered routine. As a result, many tasks will get eliminated and new opportunities will be created. To prepare associates for the digital world, the company started cross-training employees to do higher value-added jobs. After tackling the core functions of HR with its recent transformation, ADP India is now shifting to what it calls a “continuous innovation approach”. They have set up an HR Lab where HR team ideates and collaborates with the engineering team to develop new technologies to address other HR capability areas. HR transformation is not trivial as it affects every employee in an organization. The goal for ADP India was to reduce the complexity around the functions for which HR is responsible while increasing internal stakeholder satisfaction. ADP recognized that the first challenge would be to build skilled teams to identify problems. Essential to the success of this model was the buy-in — not just teams of senior leaders, but also of employees with different levels of experience across all of HR and the rest of the company. Critically, the teams needed to include employees who were recognized as change leaders to help drive lasting adoption of the new solutions and processes. The mantra for success at ADP India was in managing change through inclusion, collaboration, communication, creating ownership, and trusting people. The HR team addressed the pain points in and out and had an exceptional zeal to make things better by simplifying the processes and adding value to its associates.